GodIsImaginary.com needs technical assistance… Can anyone help? If you go to Google and type in “GodIsImaginary.com” as the search term, the top entry that Google returns is what you would expect. But when you click on the link, it does not go to GodIsImaginary.com. It gets redirected to some other web site. We have written to the site’s hosting company. They said that the problem would resolve itself the next time Google indexes the site. But the problem has not resolved itself. We would be grateful for any assistance you can provide in fixing this problem. Have you ever known someone who really trusts God? When I was an atheist, I had a good friend who prayed often. She would tell me every week about something she was trusting God to take care of. And every week I would see God do something unusual to answer her prayer. Do you know how difficult it is for an atheist to observe this week after week? After a while, “coincidence” begins to sound like a very weak argument. For those who do know him and rely on him, Jesus seems to be wildly generous in his offer: “If you remain in me and my words remain in you, ask whatever you wish, and it will be given you.”5 To “remain” in him and have his words remain in them means they conduct their lives aware of him, relying on him, listening to what he says. Then they’re able to ask him whatever they want. Here is another qualifier: “This is the confidence we have in approaching God: that if we ask anything according to his will, he hears us. And if we know that he hears us — whatever we ask — we know that we have what we asked of him.”6 God answers our prayers according to his will (and according to his wisdom, his love for us, his holiness, etc.). What is hard to understand about, “ask whatever you wish, and it will be given you”? But it never happens when praying for anything real like a worldwide cure for cancer. Now a Christian has to explain why Jesus would say something that is wrong. So they say, “God answers our prayers according to his will (and according to his wisdom, his love for us, his holiness, etc. )” Which is to say that God answers zero prayers of substance. This is the insanity. Christians believe that God answers prayers, even though God never, ever answers concrete prayers that would improve life for everyone. It can take children years to recover from this indoctrination, if they recover at all. As the leader of a ministry called Dare 2 Share, an organization that annually equips tens of thousands of teens to evangelize, I am in the motivation business. I have to be. If a clinical approach to evangelism were enough to motivate teenagers we could just do a video-based training series for youth groups and leave it at that. But it takes way more to motivate teens to actually go beyond talking about evangelism to actually doing it. There I said it. Teenagers need to be reminded of what’s at stake for those who die without Christ. In a very real way, those who don’t know Jesus are unknowingly headed 100 mph at a cliff that leads to everlasting destruction. Our job as caring Christians is to jerk the steering wheel…and to get our teens to do the same with their friends. “Punished with everlasting destruction.” Isn’t that great? So the teen evangelist’s message is, “come worship a being who tortures people for eternity!” Why would ANYONE listen to a message like that? Why worship a torturer? Such is the insanity of religion. Imagine a world where the belief in imaginary beings is treated like a mental illness rather than being condoned. The world would be a much better place. 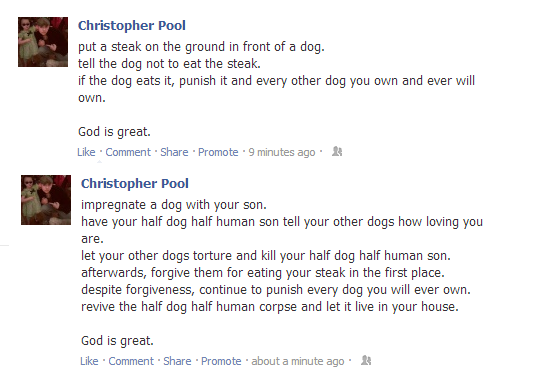 Put a steak on the ground in front of a dog. Tell the dog not to eat the steak. If the dog eats it, punish [the dog] and every other dog you own and ever will own. Impregnate a dog with your son. Have your half dog half human son tell your other dogs how loving you are. Let your other dogs torture and kill your half dog half human son. Afterwards, forgive them for eating your steak in the first place. Despite forgiveness, continue to punish every dog you will ever own. Revive the half dog half human corpse and let it live in your house. Why would anyone believe such nonsense? For saying this she appears in articles, the articles make it up to the national news level, her words “God shielded us” appear on the Drudge Report, etc. How could anyone look at this gigantic catastrophe, with all of the death, injury and damage it has caused, and then claim that “God shielded us”? Rather than making it up to the national news level, why isn’t the woman seen by everyone as completely delusional? The only way to believe that God is shielding is to also believe that God is allowing everyone else to die and suffer in all of the tragedies we see. It is painfully illogical. Any person with any common sense would ask, “You really believe that people are raised from the dead, blind eyes are opened, lame people are walking? Where is your proof?” If these things were really happening, there would be hundreds of videos on YouTube for all to see. Why would anyone, in this day and age, believe a lie like this? Why can’t Christians accept reality? If this God is so powerful, so willful and so interactive that he would “guide the hand of makeup artists” and “blind the eyes of everybody on the movie set”, then how in the world did Obama get elected? If Obama is the “devil from Hell”, how did Obama get re-elected? Isn’t God capable of guiding an election just as easily? Christians who make statements like the ones seen in this article truly do appear to be insane. Through reflection, study and reading the works of C.S. Lewis, Lee Strobel and others, Kraftson said he found solid answers to his questions early in his college career. Having concluded that God exists and does have a plan for everyone, Kraftson decided to share that message through interacting with people. “Having concluded that God exists and does have a plan for everyone…” Imagine the level of insanity it takes to look at our world and reach that conclusion. Think of the 10 million children per year who die of starvation, the millions more who die senselessly of cancer and heart attacks, the millions slaughtered in war, and the millions more who perish in natural disasters. God says, “yes, my plan for you is to grow to age three and then to be crushed when your apartment collapses in an earthquake.” Only insanity could see that as a plan. What form of insanity is this? The reason why “what she asks of me is not always clear” is because it is the sound of insanity. But enough pert answers and beating around the bush. Let’s cut to the chase. The Bible says one thing and the theory of natural selection says something else. How can I or anyone believe both? To be blunt, I can’t. I don’t believe the biblical account of creation. I can’t believe, not because of my science background, but because the Bible doesn’t say one thing. It says two. Genesis 1 and Genesis 2 offer two contradictory creation stories. Since the two different stories cannot both be believed, I rely on my God-given gifts of perception and reason for the facts. I don’t believe the biblical accounts of creation, but I do believe IN them. A story that is not factual, can still show us truth. Why is this rationalization? Because this pastor is admitting that the Bible’s creation story is nothing but a myth. Meaning it was written by ignorant men, like every other myth. Meaning that the God described is mythological. Meaning that God is imaginary. The stories of creation teach us that all things find their source in God, that we are made in God’s image, and that creation is very good. We needn’t believe the facts of the stories to believe IN the truth they carry. Facts are to be seen, measured and tested. The truth, like the Creator, is a person, not a thing to be grasped, but someone with whom to form a relationship — Jesus Christ, the Way, the Truth and the Life. He fails to see that the entire Bible is myth. You cannot “form a relationship” with a mythological being. It is embarrassing to think about this man, and billions like him, having their “realtionships” with their imaginary friends. How can adults behave in such a ridiculous way? [D]id you know that you are pre-approved for a free blessing right now? The Bible tells me so. If you have a need in your life, Jesus Christ can fix it — no strings attached. The price for your sin has been paid for you by Jesus, on Calvary’s cross. Things will get better for you; if you will only trust in him. The good news is that Jesus Christ is a right now God, savior and friend. He brings to those who trust in him a right now blessing, love, forgiveness, hope and peace. He is a God who listens, speaks and moves on our behalf! “If you have a need in your life, Jesus Christ can fix it.” Really? If that is the case, why doesn’t Jesus heal the millions of people who have cancer right now? Why doesn’t Jesus help the billions of people on the planet living in abject poverty? Why doesn’t Jesus save the 21,000 children who will die today [ref]? These people all need help. Jesus is omniscient, so he knows they need help. Yet no help will come. The fact that someone can say, “If you have a need in your life, Jesus Christ can fix it,” while looking out at the world and seeing how mismatched that statement is with reality, demonstrates a form of insanity. It is quite obvious that God is not active in our lives. We Could Use God’s Help – Where Is He? What if we erase the slate and look clearly at the situation. Something terrible happens, people suffer, they implore God for help, but no help comes. If such a thing occurred when a house caught fire and the fire trucks never came, naturally the blame would fall on those who are assigned to rescue us. Is it fair to apply the same standard to a God who fails to show up? If God exists, then “Go and do likewise” applies to God as well. The fact that God ignores all of the tragedy on earth proves that God is imaginary. Strange that Chopra cannot see that.